Anxiety affects about 40 million American adults age 18 years and older, which is approximately about 18% of the population. Mild anxiety, one would see as a stressful event such as public speaking. Anxiety symptoms that last at least 6 months indicate an anxiety disorder and would need to be diagnosed by a medical professional. Symptoms can get worse if not treated and are commonly co-occur with other mental or physical illnesses. Using alcohol or substance abuse, can mask anxiety symptoms or make them worse. In alcohol or drug dependence, these other illnesses need to be treated before a person will respond to any type of training program or treatment for the anxiety disorder. 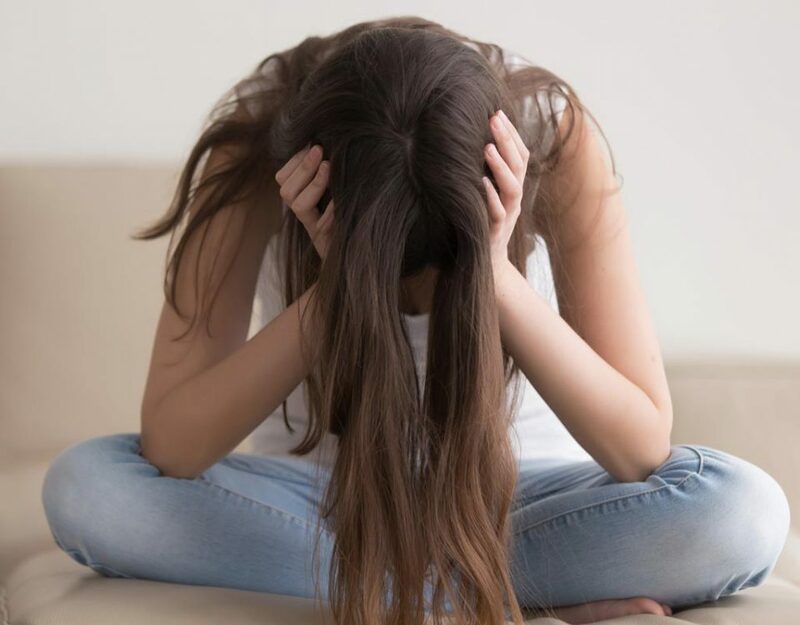 Children and teens suffer from anxiety at about 8 percent of teens ages 13-18, with anxiety symptoms emerge around age 6. Approximately 18 percent teens received mental health care. What are typical signs of anxiety? Learning – Can impact an individual’s working memory, problem solving, and making it difficult to learn and retain information. Memory – Anxiety can affect the ability to hold information in our minds for only a short periods and could forget all together. Communication – Often stops an individual from asking for the help they need. Decision-Making – Anxiety disengages neurons in the prefrontal cortex, which affect planning, understanding rules and consequences, regulating emotions and decision-making. Brain Health – It can have negative effects on social, physical, emotional, learning, performance and overall brain health. Stress-Level – Anxiety may make an individual uncomfortable in a school, home or work environment. The Calm Clinic reported that “Anxiety can be caused by life experiences, and it can be caused by the chemicals in your brain, and it can be caused by both, and no matter what causes it, it can be treated the same way. Even within your own biochemistry, there are different neurotransmitters that can cause and be affected by anxiety.” Studies (4) have shown that nearly every type of neurotransmitter and hormone can play some role in anxiety, as can anything that reduces blood flow to the brain (like dehydration). Anxiety, in many ways, is simply your body’s reaction to brain stress. When something causes any changes to your brain, experiencing anxiety is often the result. What exactly do neurotransmitters do? Neurotransmitters are information pathways to communicate different types of information to many different parts of the brain. The end result is an individual’s behavior, emotions, and thoughts. If the brainwave connections are not being met or if there is too much information, then the communication between the neurons in the brain will break down and negative symptoms will begin to emerge. Balancing the communication between neurons in the brain is needed to reduce these negative symptoms through a method called neurofeedback brain training. Neurofeedback is a drug-free, non-invasive natural approach to anxiety, panic attacks, post-traumatic stress, or impulse control concerns in children, teens and adults. Neurofeedback works to create more efficient brainwave connections by conditioning appropriate brainwave patterns, which improves a brain’s response to stress, impulsivity, anxiety, and combats the negative symptoms associated with many other cognitive issues and disorders. With neurofeedback, individuals can balance the communication between different parts of the brain across the two hemispheres and develop the skills necessary to reduce or eliminate the negative symptoms they face through positive reinforcement simply by watching a movie, listening to music or playing a video game. 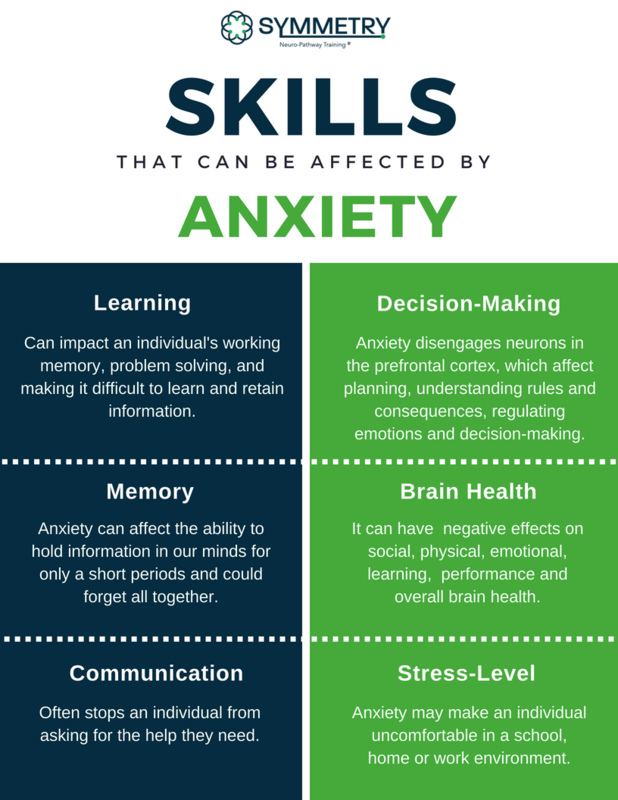 Many individuals who have been diagnosed with Anxiety generally have problems with learning, memory, stress, communication, decision-making and brain health. One way to locate the symptoms is to complete a Brainmap. 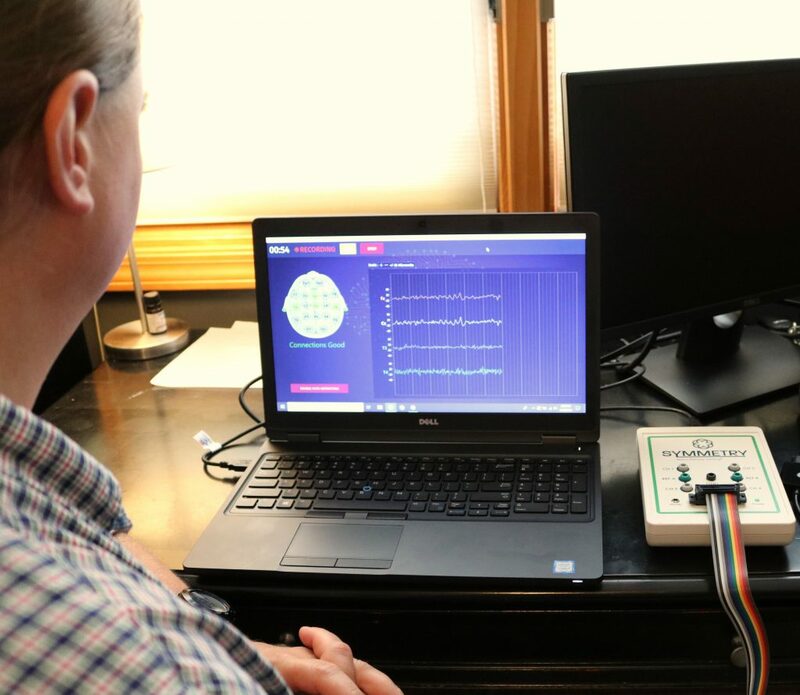 A specialized test called a qEEG Brain Map is used to record brainwave data and the results for anxiety related symptoms show an excessively fast brainwave patterns. There are many studies that show that the brain is capable of change. Neurofeedback can reorganize and re-balance the brain wave patterns through consistent practice. This is what we do at SYMMETRY Neuro-Pathway Training. We utilize neurofeedback to help improve the root cause of brainwave dysregulation and reduce the negative characteristics of anxiety symptoms. SYMMETRY Neuro-Pathway Training aims to individuals who struggle in academics, social interactions, and those that show poor behaviors in school and home. We use a holistic approach that is tailored to guide an individual’s brainwave patterns through a specialized neurofeedback training program, which is designed to meet their specific needs and optimize their brain potential. Many other programs that are available will help to work with the symptoms to improve specific areas; such as, cognitive behavioral therapy, medications, or for children will focus on sensory motor processing in the forms of exercises, activities, or play therapies. While these can be great alternatives, they are unable to look directly at the brain connections and pinpoint the locations of dysfunction. 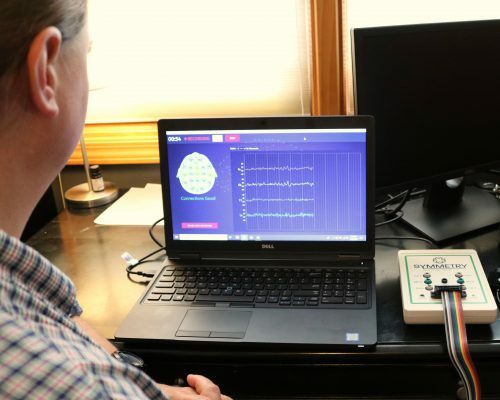 They use assessments as guides to detect symptoms while SYMMETRY Neuro-Pathway Training uses qEEG Brain Mapping to record and analyze brainwave activity to review areas of improvement. We create a tailored plan for each trainee specific to their individual needs. Our clinical team monitors progress through tracking assessments while conditioning the areas with neurofeedback and optimizing your brain potential. This would help an improve their anxiety, racing thoughts, rumination, concentration, memory, and hopefully reduce the need to use any anxiety medications as the brain would then be working efficiently and medication would be no longer needed. Research has shown that the results of neurofeedback are long-term with continued improvements once treatment has ended due to the brain is working optimally. Improved focus, attention and concentration. Feeling more calm, secure and less stressed. The main reason neurofeedback is especially important for managing Anxiety is that medication can drastically affect the quality of life. Anxiety medications are based on trial and error and one may work for some and not for another, it can also have implications on mood and behavior outside of the disorder and make symptoms worse. Neurofeedback is an additional opportunity for rehabilitation through directly retraining the brain, correcting the root cause of dysregulation and is ideal when utilized with other programs; such as, psychotherapy, cognitive behavioral therapy, occupational, physical, and relaxation therapy. We offer in-office training for those local to one of our branches and an @Home Training option at an even better price – at HALF off of what other in-office neurofeedback training providers cost! DISCLAIMER: It is important to discuss training options with your primary doctor or pediatrician concerning any diagnosis or options when concerning a behavioral, physical, or cognitive learning disorder. At SYMMETRY Neuro-Pathway Training we do not diagnose, treat or provide therapy to individuals but utilize the benefits of neurofeedback brain training to optimize brain potential through an alternative approach to medication. Lubar, J. F., Swartwood, M. O., Swartwood, J. N., & O’Donnell, P. (1995). Evaluation of the effectiveness of EEG neurofeedback training for ADHD in a clinical setting as measured by changes in T.O.V.A. scores, behavioral ratings, and WISC-R performance. Biofeedback and Self-Regulation, 20, 83-99. Pagan, N. C. (2016). Neurofeedback: Brain training for ADHD symptoms.